In our culture, mano is a term of respect for older men. Mano Crispin Gavan was the Chief of Police of Lawaan, the municipality that includes Guinob-an, and was also a schoolteacher. In 1985 he wrote a history of Lawaan that has become the main authority for the history of our municipality. I am indebted to Mano Crispin, and want to do my part to help preserve our history, so I will try to tell the history that he preserved for us in my own words. Long, long ago, before the Americans had made the Philippines a colony, and before the Spanish had made us a colony before them, and even before Ferdinand Magellan had landed on Homonhon Island in Samar and discovered the Philippines for Europe, and before we were Catholic—in that long ago time a young couple named Juan Guingot Gabrillo and Etifania Halbay set out from Guiuan a hundred miles to the east and sailed along the forested coastline of what is now Eastern Samar in their small sailboat. A big typhoon came up and they took refuge at what is modern day Lawaan. They entered the Lawaan River, and to escape the storm decided to sail further up the river where they took shelter beneath a majestic Lawa-an tree. The storm ruined their boat, and for a while at least they would have to stay where they were. After the typhoon they discovered that there was a twin Lawa-an tree, as large as the one that sheltered them, on the other side of the river. The branches from the two great trees spread across the river, and interlocked, forming a canopy over the river. The young couple explored the new environment and liked what they saw. The jungle was green and verdant; rattan and twisting, tumbling hagnaya vines grew in abundance; the sea danced and sparkled a hundred shades of green and blue and teemed with fish, crabs, and birds; wild fruits and root-crops grew everywhere; and the sounds of wildlife echoed from the forest, where wild hogs and monkeys lived and foraged. Juan and Etifania decided that no better place could be found, so they salvaged their belongings from the wreckage of their boat and built a small house from native materials. In the days that followed, Juan ventured inland where he cut rattan and hagnaya, which he knew he could sell at a good price in Guiuan. He started to make a clearing, and he made some traps to catch wildlife, especially the wild hogs whose meat was a delicacy. Juan rebuilt his sailboat and when it was ready, sailed back to Guiuan where he sold the vines and told vivid stories of the magical place he had found. He made a point of telling everyone of the beauty and abundance—and how it was easy to find, since the two great trees were clearly visible from the sea. He called the place Lawa-an, and after collecting the money for his vines and singing the praises of the place he had come to love, he sailed back and resumed his new life. Little by little other settlers came, guided by the two Lawa-an trees. Some came individually, others in groups, from places like Bicol and Leyte and Bohol and even faraway Cebu and Palawan. As centuries passed, Lawaan, still enclosed by jungle to the north and the sea to the south, became a barrio of the nearby municipality of Balangiga, and for many centuries it remained largely unchanged. In those days there were raids by the Moro pirates from the south, who attacked up and down the coast, kidnapping men and women to be sold into slavery in New Guinea, or nearby North Borneo, which almost touches the southern part of the Philippines. Our people eventually became mostly Catholic, but old beliefs lingered and mixed with the new Christian beliefs. A powerful tambalan or healing shaman, known as Agtak became famous because he could heal people who were sick, or who were believed to be possessed by evil spirits, using special concoctions that he mixed. There is no doubt that Agtak was a real person; his real name, according to Mano Crispin, was Cenesio Gavan. People came from far away to be healed by Agtak, who went naked except for a loincloth, and a camiseta or undershirt, which he didn’t wear as a shirt, but draped over his shoulders, and who lived in a tiny hut at the foot of a great Narra tree, where people would seek him out, bringing their sick relatives. There are many, many stories of Agtak, almost all involving healing of some sort. We all heard the stories growing up. The one I remember best is the rescue of the Barrio Teniente (we call it Barangay Captain today, the ‘mayor’ of a Barangay) of Basey, a nearby town. He was abducted by encantos or enchanters living in a cave in the jungle to the west near Tacloban. Encantos supernatural forest people who we believed lived in the big trees and caves in the forest. The barrio officials of Basey went to Agtak’s place at the base of the Narra tree and found him enjoying tuba, coconut wine, which was his favorite. Agtak accompanied the barrio officials, who were also escorted by police, to the forest where the Teniente was being held in the cave where the encantos lived. Agtak disappeared inside the cave and didn’t come out. Then there were sounds of a commotion inside and a large, angry monkey was hurled out of the entrance of the cave. Agtak followed and found the monkey terrorizing the men outside the cave. The monkey was hog-tied and taken to Basey; where he was anointed with holy water by the priest, and the mayor’s old self was restored but he was mute and speechless the rest of his life, as is everyone who is captured by the devilish encantos. But he lived, thanks to Agtak. This was just one of many stories of Agtak. The greatest event in our history happened in 1901, at a time when America had taken the Philippines as a colony after defeating Spain in the Spanish-American War. In May 1898 America went to war with Spain over mistreatment of its colonies in Cuba and the Philippines. 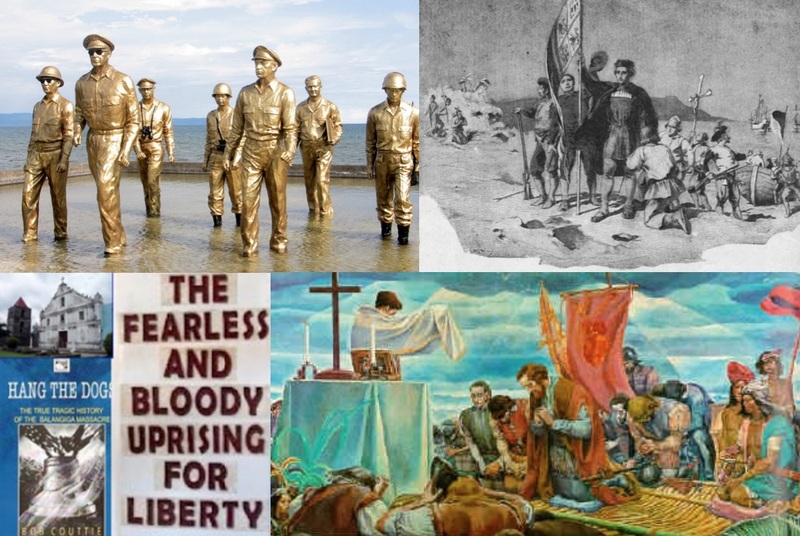 Philippine revolutionaries who had fought against Spain, led by Emilio Aguinaldo, helped America defeat the Spanish on the belief that freedom was coming. On June 12, 1898 they declared Philippine independence but in December of that year, after Spain was defeated, America decided to make the Philippines its colony. In January of 1899 Aguinaldo and the others wrote a constitution and proclaimed the First Philippine Republic, the first republic in Asia for that matter. A month later war broke out between the Philippines and America. During this war, in 1901, a group of American soldiers, Company C of the Ninth US Infantry, occupied Balangiga, which is the next town to the east. At that time Lawaan and Guinob-an were barrios of Balangiga, so we were under the occupation. It started peacefully, but the American commander closed the port, imprisoned many of the men of Balangiga and the surrounding barrios, seized the food stocks of the people, and did other things that led to resentment against the Americans. Valeriano Abanador, the chief of police, and Eugenio Daza, who was a representative of the Philippine government, organized a plan to attack the Americans while they were eating breakfast, to free our imprisoned men and drive the Americans from the town. Lawaan supplied one hundred men for the attack under the leadership of Paulo Gacho. It was a very daring and dangerous attack because there were 74 Americans armed with modern rifles, and the attackers fought only with bolos and daggers. The attack was a success. They were able to completely overwhelm the Americans in what became known to us as the Balangiga Uprising but was known in America as the Balangiga Massacre. As a result of the attack, the Americans came back and mounted a comprehensive campaign of retribution against the entire island of Samar. The leader of this campaign, General Jacob Smith, gave orders to turn Samar into a “howling wilderness” and also gave orders to shoot and kill anyone over ten years old. General Smith was later court-martialed but not before my island and ancestors had suffered terribly. Every September 28 we celebrate the Balangiga Uprising with re-enactments, and throughout the Philippines it is seen as a heroic moment in our country’s history. Fortunately, the rest of our history with America is more positive. This is especially true of World War II, when all of the men were inducted to serve alongside Americans and other Filipinos in the United States Army of the Far East (USAFFE) under General Douglas MacArthur. When the Japanese drove MacArthur out at the beginning of the war, the Americans and Filipinos who survived went into the jungles and mountains where they operated as guerrillas for three years. Then MacArthur returned as he had famously promised, sailing past Lawaan and Guinob-an before wading ashore at Tacloban, Leyte, just fifty miles to the west, and drove out the Japanese. The famous “Leyte Landing” where MacArthur waded ashore took place in Palo, Leyte, just fifty miles down the coast from Guinob-an. In 1958 Lawaan, which until then had been a barrio of the municipality of Balangiga, became a municipality in its own right, and Guinob-an became a barrio of Lawaan. For Guinob-an, it didn’t matter much; life was the same, regardless of which municipality we were attached to. That was the world I was born into and a brief history up until the time I was born. All of this happened over many centuries—but in 1974 when I was born, Lawaan and its barrios, including Guinob-an, were much as they had been for almost five hundred years, largely unchanged, abundant with fish and wildlife, and isolated from the outside world which seemed to us like a faraway myth or fairy tale. It was a magical place in which to grow up close to nature, among humble and honorable people who cared for one another and the land and sea that sustained them, and where when illness lingered and wouldn’t go away, we were still likely to turn to a tambalan very much like the legendary Agtak to address the condition which, we suspected, was the work of encantos that still lived in the forests and caves and, most importantly, in our minds. This is my home, and I can think of no other place in the world where I would rather have grown up. Learn more about these quality books about Samar available from Universal Media Publishing through Amazon.